The silver section consists of items that I have hand fabricated in silver. Like my wax section, I do not plan the design with drawing first. The stone usually causes me to visualize the silver design. The stones vary widely including material such as agate, jasper, and onyx. The wire accents are in sterling silver and/or gold filled. 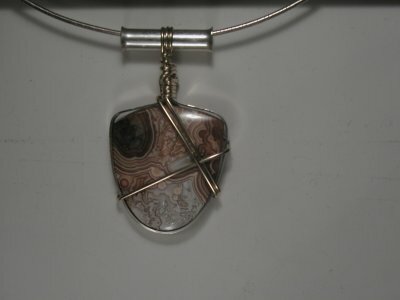 I maintain a variety of looks stones from which clients may choose to have a piece fabricated. As a result of the material and process, these are one of a kind.